Quebec’s federation of general practitioners is challenging provincial Health Minister Gaetan Barrette’s claim that family doctors in the province are not taking on new patients fast enough to meet the government's 2018 target. Quebec's federation of general practitioners is challenging provincial Health Minister Gaetan Barrette's claim that family doctors in the province are not signing up new patients fast enough. The Fédération des médecins omnipraticiens du Québec (FMOQ), said Quebec's family doctors are making progress towards a target of ensuring that 85 per cent of Quebecers have a family doctor by Dec. 31, 2017. "The rate of registration for Quebecers in need of a family doctor is now in the neighbourhood of 73 per cent, or just off our last objective of 74 per cent," the FMOQ said in a news release Tuesday. The group was responding to Barrette's claim Tuesday morning that Quebec's family doctors would fall short of the 85 per cent target at the pace that they're now taking on new patients. Barrette said the proportion of Quebecers with a family doctor now stands at 72.7 per cent – an increase of only one per cent since March 2016. "We can still recover from the shortfall, but it requires a rhythm of one to two new patients a day," Barrette said. 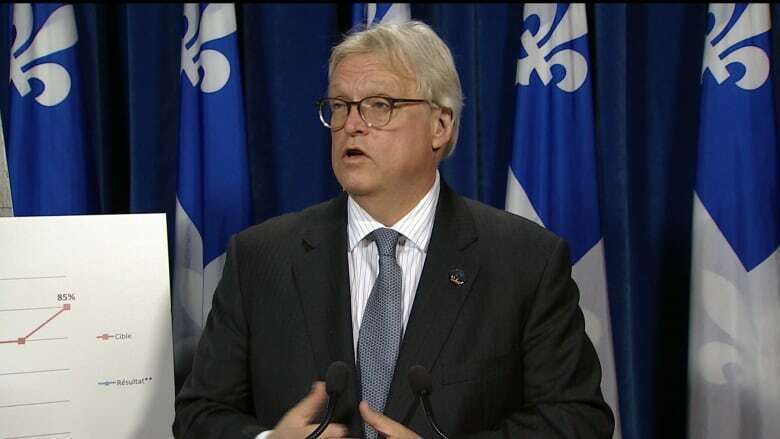 "We need to accelerate the rhythm," said Barrette, noting that 969,600 Quebecers still need to be registered in order to reach the 85 per cent target. The province may impose fines on doctors who do not take on a minimum number of patients, he said. He acknowledged, however, that Quebecers with a family doctor are seeing improved access to their doctors' services. In an interview with CBC News, FMOQ president Dr. Louis Godin agreed with Barrette that the province's family doctors still have work to do — but he said they need the government's help. "Family physicians have to do more, but at the same time Dr. Barrette has to improve support to the physicians to help them increase registrations," Godin said. "If we work both together, surely we'll be able to reach these targets." Godin criticized the online tool that the government put in place to register Quebecers in need of a family doctor, which he said has been plagued with problems. He said the government promised to provide more support, including money for more nurses to work with doctors, so that they can take on more patients, however, that hasn't happened. Godin said 450 new physicians are due to take up practice in Quebec between now and Dec. 31, 2018, which will also help with efforts to meet the 85 per cent target.